Haleem is the delicious dish and spiritual dish which is available in Ramzan month. 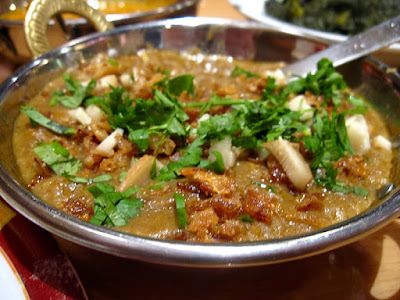 Haleem is not only a delicious dish it is also a healthy dish with many health benifits. But we are all wondering how to make this dish at home, Here I am bringing you this delicious dish at your door step so that you can cook this at your home and eat a delicius Haleem at your home. Soak the wheat overnight and keep it pounded and husked. Soak the channa and moong dal for 40 minutes. Put eight cups of water in a vessel and bring it to boil. Add the wheat, ginger garlic paste, coriander powder and chilly powder and salt . Mash the mutton pieces and add it to the mixture. Cook over a medium flame till the mutton is tender. You may also add roasted channa if you like.